If you are a bootstrapping company or brand looking for ways to join various online conversation and promote your product you might want to look at BuzzGain. BuzzGain is a do-it-yourself PR and marketing solution that just launched into public beta today. It empowers businesses to identify online communities such as blogs, Flickr, Youtube, Twitter, and also traditional media so that companies can then reach out and share their story. BuzzGain prices range from $99 to $999 per month depending on the revenue of the company. BuzzGain was co-founded by my friend, Brian Solis and Mukund Mohan. Check out TechCrunch's further analysis of BuzzGain. Watch and interact live over the Web! Today at 7 p.m. EST, I am chatting with Washington, DC local marketing/PR guru Rohit Bhargava the author of the new book, Personality Not Included: Why Companies Lose Their Authenticity And How Great Brands Get it Back. I am excited to be able to chat with Rohit tonight as part of the Network Solutions powered event that SOMEWHAT FRANK teamed up to host. Personality Not Included is different from your typical marketing book and we are going to discuss it at this event. The actual event is sold out but you can watch it below thanks to BlogTV. Stickers are part of the Web 2.0 culture as just about every startup, blogger and social media expert knows. 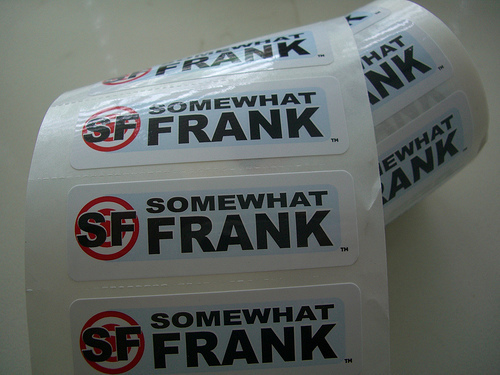 I recently got a package delivered to me from the StickerGiant.com, a Colorado-based sticker company, which was filled with stickers that sport the SOMEWHAT FRANK logo. They are awesome - thank you StickerGiant! I just spoke at the Social Rockstar Workshop at Busboys & Poets in Washington, D.C. about Social Media & Blogging. It was a great conversation and thank you to everyone that attended. I have uploaded to docstoc the online document sharing site for anyone that would like to take a look at the presentation. I got some social media feedback from some of the attendees here and here. Compete, the Boston-based web analytics and online market research firm startup founded in 2000, was just acquired by Taylor Nelson Sofres plc (TNS), a leading market information and insight company for $75 Million. Compete leverages clickstream data to determine traffic, engagement and other valuable analytics. According to the press release TNS plans to leverage this data to provide insight based on online and offline behavior and on consumer attitudes. 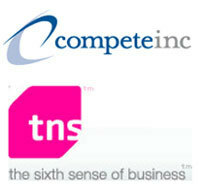 Congrats to Compete on the recent acquisition! Now is Gone so you had better get ready to embrace a new media. 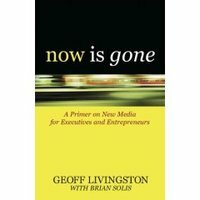 I previously chatted with Brian Solis about, Now Is Gone, a book he helped Geoff Livingston author. 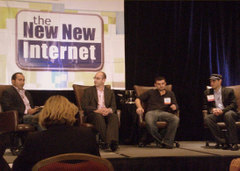 I sat on a panel discussing social media with Geoff at the New New Internet conference this past November, when he announced his book. So I was happy to finally be able to chat with him about it. If you are an online marketer you might be looking for a place to connect and share ideas with other marketers. Gooruze was recently launched to offer a ranked advice community for online marketing professionals. Photo of the Week: This illustration titled cubs by greasy chicken face is my attempt to will my favorite baseball team, the Chicago Cubs, into the playoffs. I know it's not very web/tech related but its the Cubbies, it is mid-September and they are still leading the National League Central pack. 30elm recently launched to create a hub to help connect home owners with interior decorators, home building and renovation professionals. 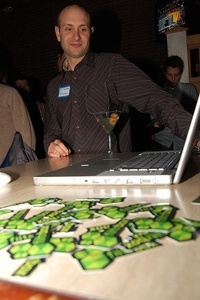 30elm was started by Matt Myers and Chris Conley from Matt's apartment in Brooklyn. 30elm offers a couple of different functions as it caters to both home owner and design professionals. Home owners can follow along as others in the community renovate their homes by reading the latest blog entries and case studies. Case studies can range from a number of home design topics. I found this interesting case study that highlights a barn that was converted into a lovely home. If you are starting a home improvement project you can upload your photos and get advice along the way from other home design enthusiasts and professionals. Home owners that already have their own blog you can use 30elm to syndicate it through the community. It is free for home owners to use 30elm. Design professionals can leverage 30elm to contribute blog entries, case studies and work with home owners to help then with their design needs. Priced from free to $499 a month based on the number of leads generated, design professionals can use 30elm as a lead generation platform. Additional pricing details can be found here. Bottom-line: 30elm is a home design community for both designers and home owners alike.